When I last checked in here nearly a month ago, I was looking forward to seeing what Mr. K and I could get rid of, following up on our successful decluttering of the laundry room. The answer turned out to be some of our Christmas stuff and many decorative objects I’d forgotten we had. 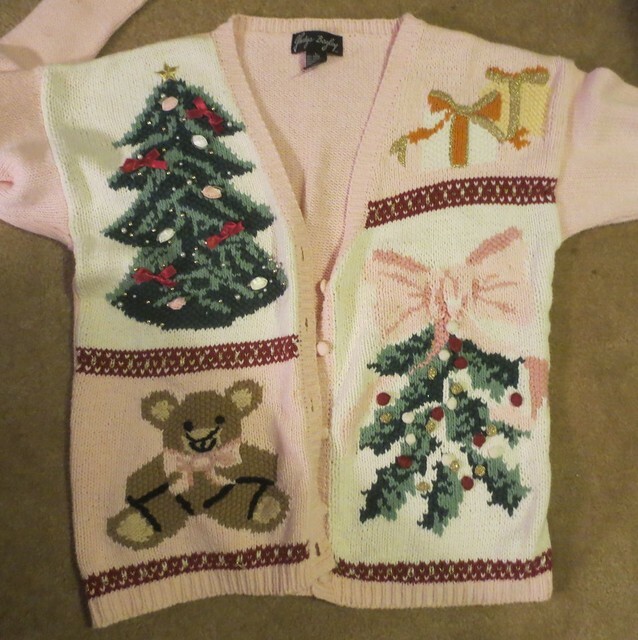 One of the Christmas items that went was this sweater, which I remember wearing in the late 80s. I wanted to be festive but not stereotypical, thus I chose this one with a pink and creme color scheme rather than screaming red and green. I would have preferred this not have the teddy bear, as that’s too cutesy for me, but as it was on the lower quadrant there I could hide it with my arm for photos and such. 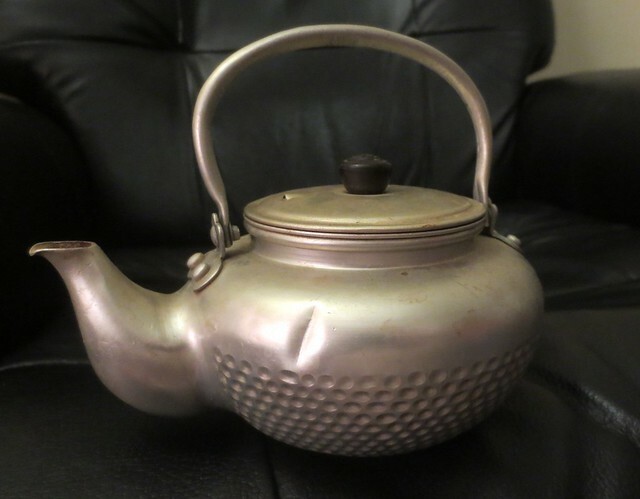 Something I did have trouble letting go of was a somewhat battered little metal teapot. I wasn’t displaying it, nor had I ever used it, even though I do drink tea, so it wasn’t an active part of my life, just another thing stored in a box in the basement. If the box this was in disappeared, I don’t think I’d miss this teapot specifically, though I recognized it when we unpacked it. 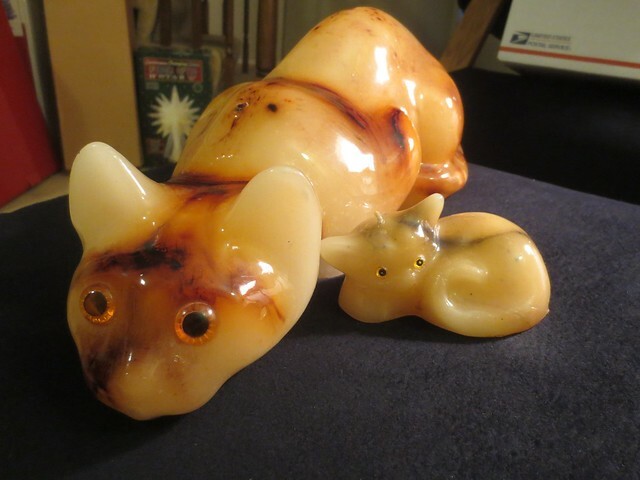 But despite not having a strong connection with this object, I didn’t want to let it go, because it belonged to my dad, and it’s from Japan, and his interest in (bordering on obsession with) Japan is one of the good things I remember about him. But I can remember that without keeping every single thing I have associated with him and Japan in the 1960s. So the teapot has moved on in its journey through the world. Mr. K has been doing some travelling, and I’ve been busy at work, so the decluttering has slowed down for the past couple weeks, but a week from now, I will be wrapping up my last day on the job, and then we will hit it hard. We have to; we have bunches of people coming to visit in July, and need to get realtors through to get their opinions on what needs to be done to make our house more attractive to buyers (other than the obvious getting rid of stuff to make the spaces look more spacious). Yet we are also planning some fun, like going to a concert on a Monday night and a baseball game on a Tuesday afternoon, because there’s no point in being retired if we’re not going to enjoy ourselves. “The Life-Changing Magic of Tidying Up” by Marie Kondo and watching “Hoarders” marathons), and find little treasures at every turn! Taking a picture definitely makes it easier to let stuff go.